I love them! What a cute idea. OMG! So so so so cool. I love this so much. I have the same problem with horizontal stripes. My nails are really curved though :( But these are absolutely adorable!! This is adorable.! I went as Dorothy a couple of years ago to my office Halloween party. This year I don't feel like dressing up but decided to do "costume nails" instead. And I have the same issues with stripes- I think it's the curve of my nails as well. Sooooooooooooooo cute! I really, really, really love this, eek!!! 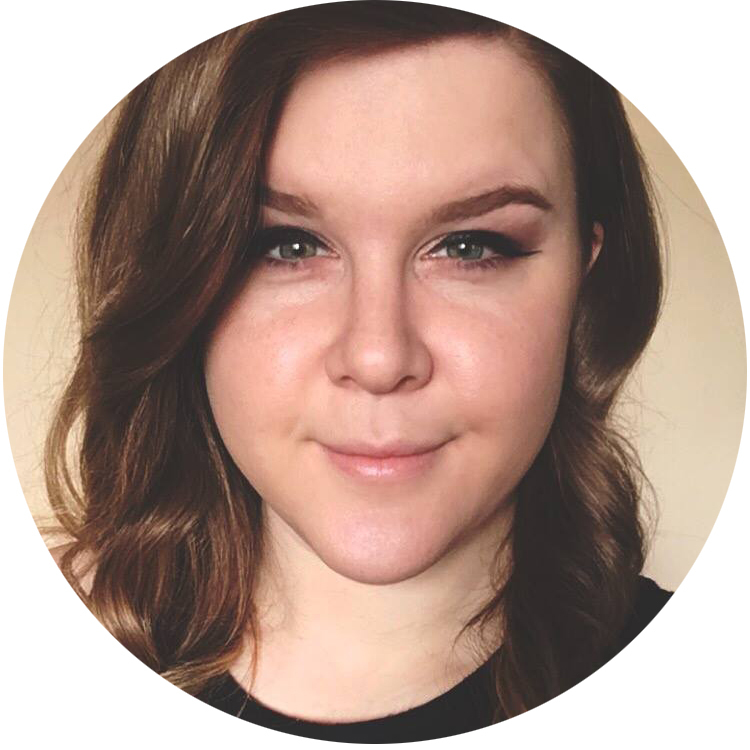 Ok so I love all your designs...but you know what the problem is???? I can never decide which one to try, too many awesome ones to pick from! You're so right about dressing up our nails for Halloween too! I'm super pleased that you did a happy design instead of a horror or scary Halloween nail design. 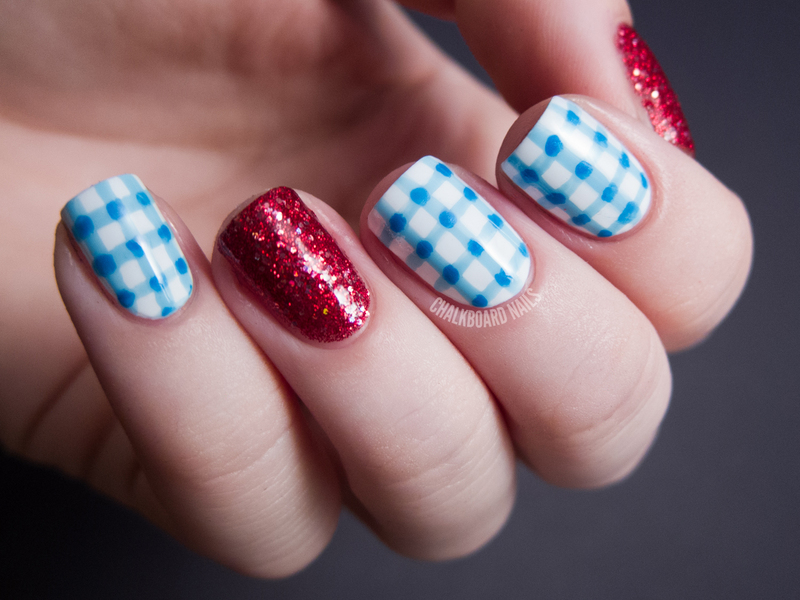 Wow I love how you did the plaids, you're so creative. This is absolutely adorable, I can't get over it! The plaid is perfect. These are amazing! Such a great idea! 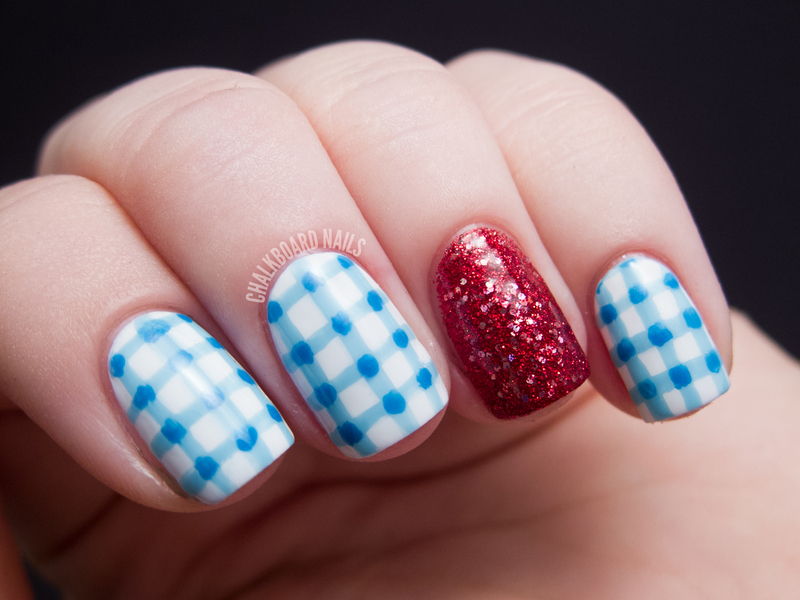 I was Dorothy last year, I might have to do it again with this mani one day! This is such a cute idea. 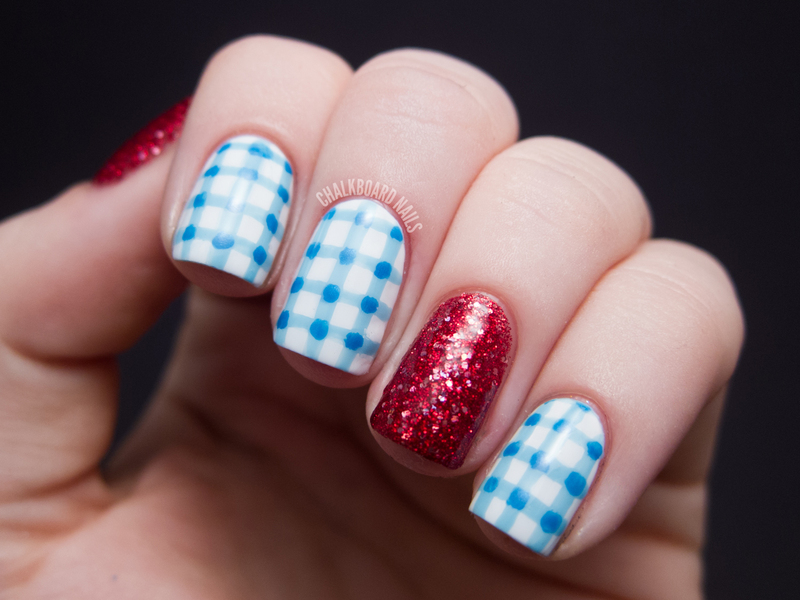 I really love how you did the gingham, it's simple but at first it doesn't look like it. Very cute, I love this! :D You are so talented and it is always so fun to go in here. Soo cute!! You did a wonderful job on the freehand stripes. You're braver than I am! Fabulous, the two color blues look amazing! Really cool idea. I love it. 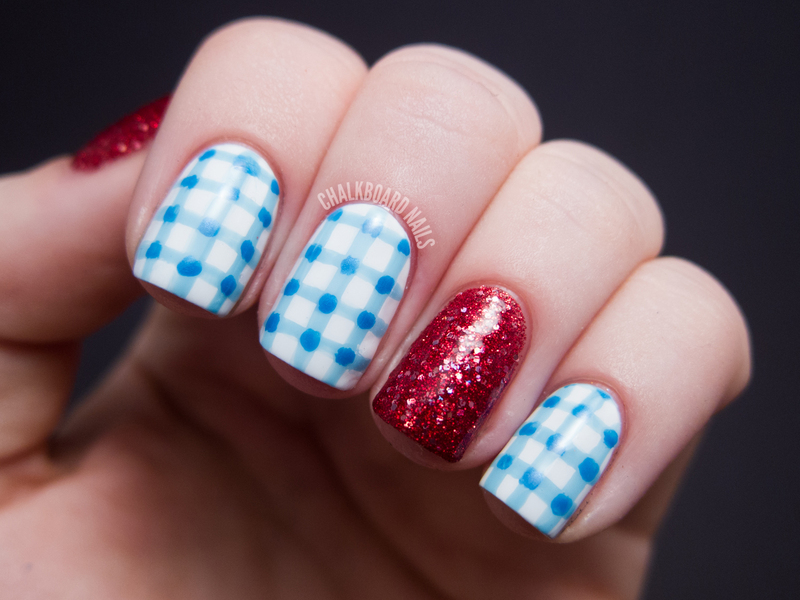 I already love gingham nails, so the addition of the ruby slippers was just pure awesome. Love Dorothy. The ruby red slipper nails are fantastic! You said you took your time with doing the stripes (and it def paid off), how long did it actually take to complete? I thought the plaid was a stamp! Your freeman work amazes me every time I see it. Do you do both of your hands with the same designs? If it's something simple like this, yes! If it's a more intricate design, I will often just do a simplified version on my right hand. You are awesome. I am SO doing this for work. I work at an elementary school, and I'm going to dress up as Dorothy. I am totally doing my nails like this! (Except I would never be able to freehand it, so I'll just try to stamp it). Thanks! Wonderful nail art! Makes me all bubbly inside! I'll definitely have to try this one. 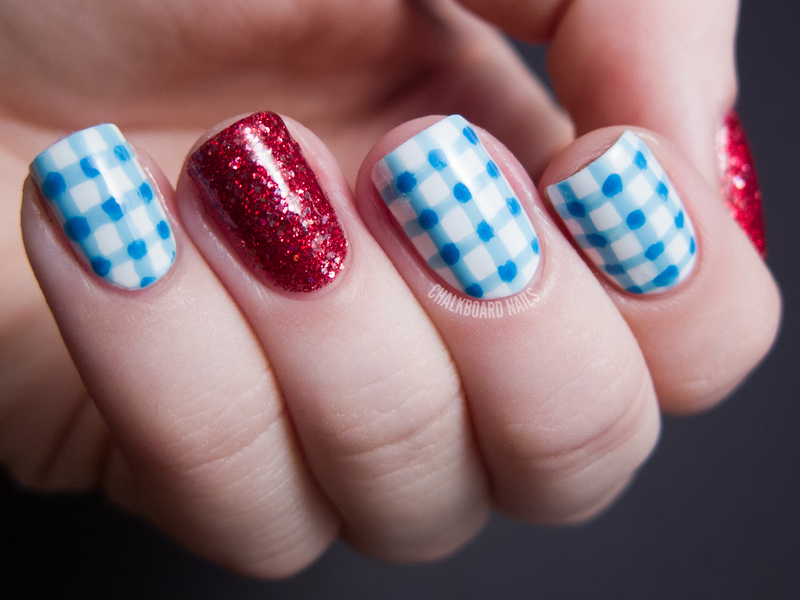 The gingham nails are stunning.